Plant and microbial use of nitrogen (N) can be simultaneously mutualistic and competitive, particularly in ecosystems dominated by mycorrhizal fungi. Our goal was to quantify plant uptake of organic and inorganic N across a broad latitudinal gradient of forest ecosystems that varied with respect to overstory taxon, edaphic characteristics, and dominant mycorrhizal association. Using 13C and 15N, we observed in situ the cycling dynamics of NH4 + and glycine through various soil pools and fine roots over 14 days. Recovery of 15N as soil N varied with respect to N form, forest type, and sampling period; however, there were similarities in the cycling dynamics of glycine and NH4 + among all forest types. Microbial immobilization of 15N was immediately apparent for both treatments and represented the largest sink (~25%) for 15N among extractable soil N pools during the first 24 h. In contrast, fine roots were a relatively small sink (<10%) for both N forms, but fine root 13C enrichment indicated that plants in all forest types absorbed glycine intact, suggesting that plants and microbes effectively target the same labile soil N pools. Relative uptake of amino acid-N versus NH4 + varied significantly among sites and approximately half of this variation was explained by mycorrhizal association. Estimates of plant uptake of amino acid-N relative to NH4 + were 3× higher in ectomycorrhizal-dominated stands (1.6 ± 0.2) than arbuscular mycorrhizae-dominated stands (0.5 ± 0.1). We conclude that free amino acids are an important component of the N economy in all stands studied; however, in these natural environments plant uptake of organic N relative to inorganic N is explained as much by mycorrhizal association as by the availability of N forms per se. J.W. McFarland conducted all field work and analyses and wrote the manuscript. R.W. Ruess and K. Kielland contributed to the overall design of the experiment and to editorial comments on previous drafts of the manuscript. 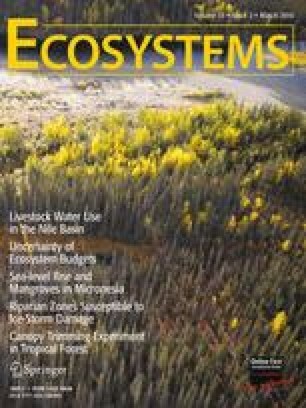 K. Pregitzer, R. Hendrick, and M. Allen contributed background information for each forest type as well as editorial comments. We are very thankful to Greg Mauer for all his cheerful effort in the field. We also appreciate the expert technical assistance from Lola Oliver of the Forest Soils Lab at UAF. This project would not have been possible without the logistical support provided by Dr. Andrew Burton of the School of Forest Resources and Environmental Science at Michigan Technological University, and Lee Ogden of the Warnell School of Forest Resources at the University of Georgia. Our research was supported through grants from the National Science Foundation’s Ecosystem Studies program (DEB 966537), and by the Bonanza Creek Long-Term Ecological Research program (funded jointly by NSF grant DEB-0620579 and USDA Forest Service, Pacific Northwest Research Station grant PNW01-JV11261952-231).